I was bragging, by the way. Didier wrote: I was bragging, by the way. Started to go check it out. It was too hot. Still not sure there will be anything to do in this park. Throw around a Frisbee, read a book, drink some water, eat lunch, study, do yoga, etc. Not much different than Gold Medal. I kind of agree...though I know it isn't done yet, and there are later phases. Though, we were initially just supposed to get grass until they could get the funds together, so I guess this is a good start. When I was walking through the park on Tuesday, I was hoping to myself that they wouldn't "upgrade" anything. I like that it's relatively simple and not overdone. 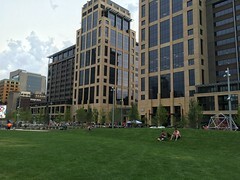 Just a really nice open space downtown. I just think the big blank spaces along 4th with the semi hard finished surface for "future programming" are odd. I feel like maybe they should have just made them grass for the time being. The fences are down on the second block, although it looks like they are still doing finishing touches. Walked through this morning. 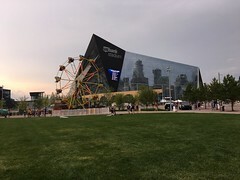 The park certainly looks nice, and will be great for the residents of the Edition, but I'm still concerned about what people will do in it when there aren't events at the stadium or food truck out for workday lunches. amiller92 wrote: The fences are down on the second block, although it looks like they are still doing finishing touches. Walked through this morning. 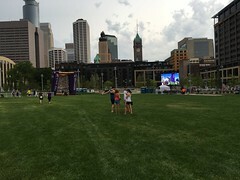 The park certainly looks nice, and will be great for the residents of the Edition, but I'm still concerned about what people will do in it when there aren't events at the stadium or food truck out for workday lunches. I think that I've said somewhere in this thread that this was a genius move by Ryan to "give" this park to whoever would take it which at once abdicated the maintenance for the park while giving the appearance of being beneficent/charitable but in fact, this park would become a de facto park for the adjacent residential buildings during the 357 days a year when NFL football is not being played at US Bank Stadium. I assume they'll do the same things that people all around the city do during unprogrammed times at their local park. 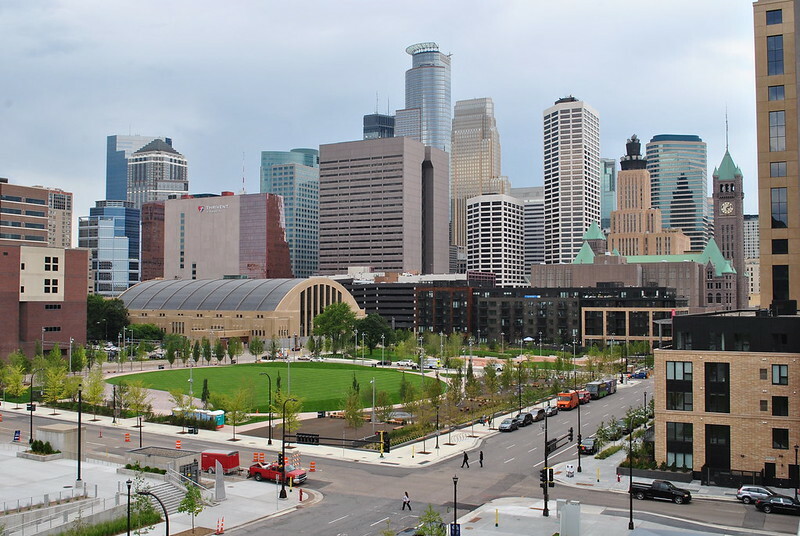 I think just having green space downtown is nice and you don't have to have any real programming to have a decent park. xandrex wrote: I assume they'll do the same things that people all around the city do during unprogrammed times at their local park. Will they? At the moment, anyway, there's almost no playground equipment. There's no water to play in or look at. There are no sports facilities. There are only a few mature trees to hang a hammock from. And there aren't all that many residents for whom this is the closest park. Anyway, it will be fine during the day on weekdays, especially if they can expand the food truck offering, but it is going to need a reason for people to go there on evenings and weekends. amiller92 wrote: Anyway, it will be fine during the day on weekdays, especially if they can expand the food truck offering, but it is going to need a reason for people to go there on evenings and weekends. Which is to say, it'll be active when there are plenty of people downtown, and relatively deserted when downtown is deserted. So... not so much a problem with the park as with the neighborhood.